"The Dust of Years" is the first full length album in 15 years from this British band. Formed back in 1987 in the West Midlands, Seventh Angel managed to release "The Torment" in 1990, a split album called "White Metal Warriors - Last Ship Home" in 1991 and before splitting up in 1992 they released the "Lament for the Weary" album. Then in 2005 a live album called "Heed the Warning - Live" including 8 live tracks and the 1990 demo "Heed the Warning" was released. Well enough with the history lesson. 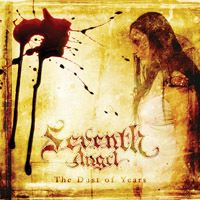 On the new album "The Dust of Years" Seventh Angel delivers a good mixture of doom, thrash and death metal. I have to admit that I was a bit sceptical the first time I was listening to the album, but after several spins I was hooked. I guess that the best description of Seventh Angel's music is something like old school thrash like Xentrix meets My Dying Bride and Opeth. One of the best things on "The Dust of Years" is change of clear vocals and growls, just phenomenal. The best tracks are "In Ruins", "Lamentations" and "The Raven Sky". These 3 tracks deliver all the trademarks of Seventh Angel in 2009.